Karen, you have a pioneer relative! You are here: Home / Black / Karen, you have a pioneer relative! That was the subject line of an email I got this morning from FamilySearch, the website and genealogy organization operated by the Church of Jesus Christ of Latter-Day Saints (otherwise known as LDS or Mormons). When I clicked on the link, I expected to find a familiar name, but Eleanor Martin was not previously known to me. Turns out she’s my first cousin six times removed. The connection goes all the way back to my notorious 3x-great-grandfather Benjamin Franklin Black, who I’ve written about extensively. FamilySearch provided a helpful chart showing how Benjamin is connected to Eleanor Martin. Benjamin was a first cousin once removed to Eleanor Martin. 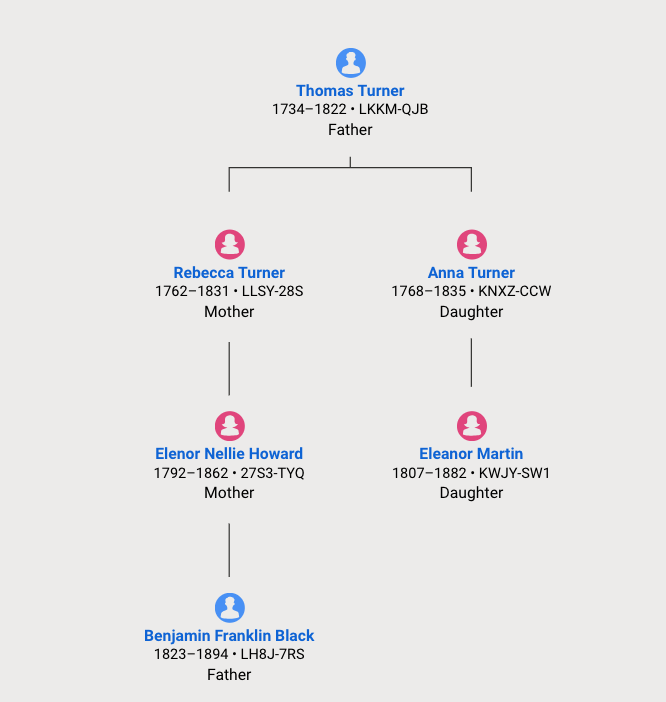 The man at the top of the chart, Thomas Turner, would be my 6x-great-grandfather. He was born in North Carolina but later settled in Madison County, Kentucky2. This branch of the family would remain stationary in Madison County for a few generations; I believe Benjamin Black was himself born in Madison County. Joel and Eleanor Ricks later moved to Nauvoo, Illinois, which was a significant launch-point for the earliest Mormons. In fact, Joel and Eleanor were members of the Heber C. Kimball wagon company that left from “Winter Quarters” in Omaha, Nebraska in 1848. Joel and Eleanor’s oldest son was Thomas E. Ricks who was kind of a big deal in the Mormon community. My favorite fun trivia fact about Thomas E. Ricks was that he was a founder of a school that eventually became known as Ricks College (though it is known today as Brigham Young University – Idaho). 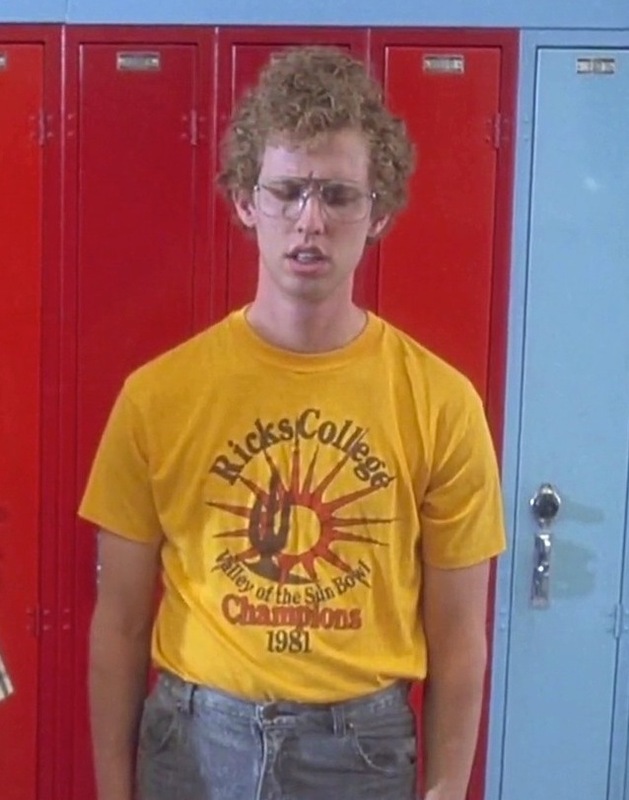 Ricks College was forever memorialized in the film Napoleon Dynamite, in which the title character wore a Ricks College tee-shirt. The shirt was sort of a insider joke that signaled that the movie’s characters were in fact Mormon (as were the producers and many of the actors). 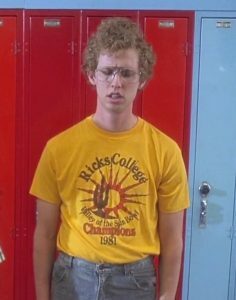 Thomas E. Ricks would have been Benjamin Black’s second cousin; thus I am the second cousin five time removed of the guy on Napoleon’s tee-shirt4. This is soooooo awesome! All joking aside, FamilySearch has connected me as a distant cousin to 20 LDS pioneers in all5. Nine of them are in the Ricks clan, eight are through Tunstal Quarles Matthews (Benjamin Black’s father-in-law), two are through an even more distant ancestor of Elinor Howard, and one is through the Bass family. Most of them were part of the Winter Quarters encampment in Omaha, Nebraska. I can also confirm Ancestry.com DNA matches to my mom for Thomas Turner as a common ancestor; many of these include the Ricks family. One of Tunstal Quarles Matthews’ descendants converted to Mormonism much later than these pioneers. That descendant’s son, Frank C. Robertson, wrote a book, “The Ram in the Thicket”, about his family’s experiences in Nebraska and Idaho. The great thing about being connected this closely to Mormon pioneers is that there’s a ton of high-quality research about the ancestors I have in common with them. I’m looking forward to digging deeper into the Howard, Turner and Matthews families someday. 1That particular Elinor married into the Gilchrist family and she is known in our family tree as Ellen Gilchrist. When Ellen died, my great-great-grandparents Edward and Ida Frasier helped look after her children. Ida was, of course, Ellen’s younger sister. 2Thomas Turner’s second wife was Nelly Dill; whether she is connected to my Dill family is unknown. 4We have yet another connection to the Ricks family. One of Daniel Dill’s sisters married a Levi Ricks, who shares ancestors with Joel Ricks. 5Link is here: https://www.familysearch.org/pioneers but it probably won’t work effectively unless you have a familysearch account and have created a family tree on their site. A surprising family connection. The book is on my to read list for the summer. It has been a long time since I first read it. Who would have known that we Lutherans, Coventers and Catholics have ties to the Mormons.